Located as part of the exclusive Cap Estate and opened in 2008, Cap Maison is a real treasure waiting to be discovered. 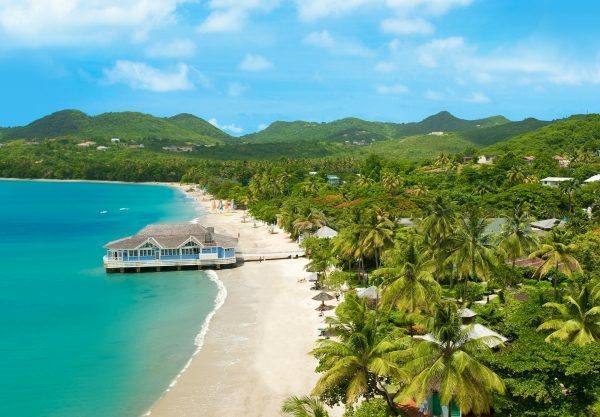 Combining luxury, comfort and privacy all set in luscious tropical surroundings, the resort is sat on the hills and offers guests stunning views out over the Caribbean and to nearby Martinique. The resort has a distinct Spanish-Caribbean style, its suites and villas are subtly elegant and spacious. Attention to detail is evident wherever you look, from designer furnishings to unobtrusive technological touches, private pools and large sun terraces. In addition the resort also has two large swimming pools to enjoy and cool off in. A private and secluded beach is great for swimming and snorkelling, and you have free use of beach chairs, parasols and non-motorised water sports. And if all that wasn’t enough, Cap Maison is also the only hotel on the island to have their own luxury 46ft yacht – Cap Maison I – which is available for private hire and a perfect way to spend the day. Service is everything here, with the staff priding themselves on going the extra mile for their guests, and as one of the top independent hotels on the island it offers a level of sophistication and personalisation not seen in the larger resorts. The resort’s 49 rooms are spread out amongst two storey villa-style blocks and is designed to be as flexible as possible to meet your needs. The larger 2 and 3 bedroom rooms comprise of adjoining or adjacent suites and guests can easily add or subtract rooms as needed. All rooms feature air-conditioning in the bedrooms, fans throughout, flat screen TV and Bose music system, en-suite bathrooms, verandas, mini bars and tea/coffee makers, internet access and paintings by local artists. Villa suites also have a living room and kitchen. Garden View Room – The garden view rooms are beautifully located amongst the tropical gardens and are beautifully appointed. A balcony or terrace offers space to relax and admire the view. They sleep up to 2 people in a king size bed (twin beds on request). Ocean View Junior Suite – These beautiful and intimate rooms have lovely ocean views from a private veranda as well as a small sitting/dining area. Some even include an outdoor shower. They sleep up to 2 people in a king size bed (twin beds on request). Courtyard Villa Suite – Generously sized, these villa suites are found in the Spanish Courtyard nestled amidst lush gardens and one of the resort pools, with great access and views from the front verandas and balconies. They have a separate living/dining area and sleep up to 2 people in a king size bed. 1 Bedroom Ocean View Villa Suite plus Jacuzzi – Located on the cliff’s edge overlooking the private beach, these large villa suites are set across two levels with a living/dining area and veranda downstairs and a large bedroom with Jacuzzi tub on the adjoining balcony upstairs. They sleep up to 2 people in a king size four-poster bed. 1 Bedroom Ocean View Villa Suite plus pool – These spacious villa suites are located on the ground floors and have access to your own private pool in the front – simply step off your large veranda. Surrounded by the gardens, you have great ocean views to admire. They sleep up to 2 people in a king size bed. 1 Bedroom Ocean View Villa Suite plus pool + roof terrace – Offering some of the most lavish and spacious accommodation on the island, these opulent villa suites feature a large master bedroom, living/dining room, full kitchen and large private verandas. Upstairs a magnificent roof terrace has a pool, sun loungers, gazebo and dining area, all with spectacular views in all directions. They sleep up to 2 people in a king size bed. 2 & 3 Bedroom Villa Suite – The villa accommodation can be modified to suit your needs, with the potential for a 1 bedroom villa suite connecting with a garden view room to form a 2 bedroom villa suite, and with an adjacent (but not interconnecting) ocean view junior suite to form a 3 bedroom villa suite. The specs are as above. The 2 bedroom option will sleep 2 – 4 people and the 3 bedroom option will sleep 3 – 6 people. Dining at Cap Maison emphasises fresh and seasonal produce with typically French and Caribbean influences. Service is attentive but unobtrusive to allow you to enjoy your meal and each other’s company. The Saturday night Caribbean tapas and live music is one of the most popular dining experiences in St Lucia. The Cliff at Cap – Arguably one of the most spectacular spots on the island, the restaurant is perched on the cliff’s edge with unrivalled views wherever you look. Offering casual breakfasts and lunches before transforming into a fine dining experience for dinner with contemporary cuisine all created by award-winning chefs. A special dinner for children can be served between 5:30pm – 6:30pm on request. The Naked Fisherman Beach Bar & Grill – Located right on the beach under the shade of a thatched roof, there is a wide selection of rums, wines, cocktails and beers to quench your thirst, and when it’s lunch time you can enjoy freshly prepared seafood, ribs and burgers all to the tune of Caribbean music. The rum punch is a firm favourite here! Cliff Bar – The Cliff Bar is located next to the Cliff at Cap restaurant and provides the perfect setting and service for pre-dinner drinks. It is also next to one of the resort’s main pools making it great for walking in on a hot day and grabbing a refreshing cocktail, all while admiring the stunning views. Open from 10:00am daily. Wine Cellar – A brick-lined and vaulted cave surrounded by 1,500 wine bottles. A wide selection of wines is on offer, and tastings are held regularly. With an elegant dining table seating groups of up to 8, this is a wine lovers ideal dining location. Theo’s Bar – An air conditioned space to enjoy comfortable indoor lounging, games, sports viewing and a beautiful cards table. The terrace, shaded by the spreading Saman tree, is perfect for cigar smokers. Rock Maison – a wooden deck surrounded by the sea on 3 sides with drinks delivered by zip line. Also the perfect place for your Yoga and Tai chi lessons or a Spa treatment. To compliment your own private pool if you have one, the resort has a series of infinity style pools by the edge of the cliff, or a quieter experience in the Spanish-style courtyard. The private Smugglers Cove beach is great for swimming as well as a host of complimentary non-motorised water sports including snorkelling, kayaks, hobie cat sailing and windsurfing. You can also book waterskiing and banana boat rides for a fee. There is also a championship golf course nearby as well as tennis courts at The BodyHoliday. In addition there is kitesurfing and scuba diving offered by local companies which are great for the more adventurous. The resort’s private motor launch, the Cap Maison I, is a 46ft luxury yacht which is available to hire for the day and is great for groups of up to 12 people. An air-conditioned fitness centre is also available with resistance machines, free weights and cardiovascular equipment. It also offers classes and yoga (some for an extra fee) and there are many walks and trail runs nearby if you prefer some fresh air for your exercise. Spa Maison offers an opportunity to indulge yourself and be pampered. Treatments can be taken in the privacy of your suite or room, on your terrace, on Rock Maison or under a gazebo in the garden – the choice is yours. Spa Maison also offers treatments for men, and from time to time they can offer other treatments from visiting therapists such as reflexology and shiatsu. Afterwards you can relax on the terrace outside and watch the birds and trees, whilst sipping a tisane or cold drink. Although Cap Maison may appeal more to adults than children, there is still plenty for the little ones to do and several incentives that make travelling as a family more appealing. Villa suite accommodation is great for kids, with up to 2 under 12 year olds sharing with parents for free. Kids Club (NEW) 1st July to 15th September for 3-11 year olds. Located in a Villa Suite for the Summer, this is NEW to Cap Maison and will include soft play areas, kids books, movies and toys, Wii and a full time Kids Club supervisor with many years experience offering a wide range of outdoor and indoor activities to keep the little ones engaged. Children under 12 also eat for free with their parents and there is 4 hours of free babysitting available for one night during your stay (note these are only applicable for certain times of the year and when staying at least 7 nights).